– If a bat flies into a house it is a sign that ghosts are about and maybe the ghost let the bat in. – If bats come out early and fly around playfully, then it is a sign of good weather to come. – If a bat flies around a house 3 times, it is a death omen. I feel so terrible now. I don’t know how, but it got into the house. I was scared for the cats and me, and I called the Department of Health who transfered me to Animal Care and Control, who said they’d send a truck, but they didn’t know when. So I found a website of bat people in Texas, called them, got a biologist who told me all about bats and how to catch him, and so I did! It was VERY VERY SCARY, but I did it. 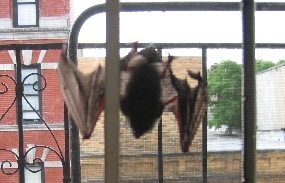 I can’t tell you how scared I was walking up and climbing up on my desk to catch that bat (he was in the curtains). ACC came and we all decided to release it. So we did, it flew and then went right to the ground, flopped a little, it was clearly sick. The guy said he’s released hundreds of bats and usually they fly right off, this one was sick. So they had to take it away. It was so beautfiul for a second while it flew. It will be tested for rabies, which means it will be killed. I feel awful. Everyone was very careful about “did it ever touch me or the cats,” but it didn’t. I still don’t know how it got in. Poor thing. The ACC guy said it was looking for shelter. The ACC guy could tell I felt bad, and he told me normally when they get there people are freaking out and in any room but the same room with the bat, and I was the first person who had caught the bat before he got there, but I think he was just trying to make me feel better. The biologist in Texas told me that bats get into people’s houses all the time, and it’s really not a big deal to catch them and let them go if they did not have contact with people or pets. I think it’s a sign… Commissioner Gordon needs your help! Bats can squeeze themselves into cracks smaller than your little finger. To the best of my limited knowledge, bats don’t dig, tear (e.g., screens), or otherwise modify their environment. Sorry for your bat’s misfortune. An Indiana caver, now living in San Diego. Where can I get a pet fruit bat? Please email me.